Using your money for the common good is a noble and compassionate deed. It’s hard not to have your heart strings tugged at when you see someone in need, especially during these bitter cold months. And when you hear about an event that’s left countless people displaced from their homes and everything they know, your first instinct is to figure out how you can help. In today’s culture, it can begin to seem as though there are causes and charities coming from every direction. Between Facebook, Twitter, and sites like GoFundMe, there’s a multitude of individuals and organizations asking for donations. Unfortunately, due to the high amount of charitable causes, there are plenty of scammers and untruthful people who throw their name in the charity ring as well. That being said, when you go to donate to charity, in a world where you rarely see the person or organization you’re giving to, how do you know you’re not just getting sucked into charity scams? Here are some ways you can avoid charity scams. Anytime someone catches you off-guard, whether that be in-person or on the phone, it can make you feel pressured to give. This is especially the case during the holidays when people often wait outside public places, like the grocery store. While this isn’t to say that everyone that does this is bad, it is to say that there’s no way of knowing who or what organization you’re dealing with. Furthermore, when you’re caught on the spot, you’re also more likely to donate more than you might normally. As with anything, you should always take time to do your homework. Any legitimate charity has standards for running their organization, which means they fill out tax filings and report their income. More often than not, they also tend to give their numbers to outside charity sites that have rating systems. The important thing to examine when looking at various charities is where exactly your money’s going. Is it going to administrative, fundraising, or aesthetic purposes, or is it actually going to the people or cause you’re hoping to help? Do thorough research on any charity before donating any amount to avoid charity scams. Often times, when various charities support the same or a similar cause, their names can become similar as well. Of course, that’s also the case for individuals looking to scam you. Whether you’re looking to invest in a particular charity or just trying to avoid being sucked into any charity scams, pay close attention to the charity you’re giving to, to ensure you have the correct one and not an imposter. And if there are multiple, similar ones for a certain cause, again, do adequate research to see which one operates in a way that’s important to you. One of the biggest ways people get others to donate is by appealing to your emotions and making a connection. Nonetheless, legitimate or well-known charities aren’t likely to stoop to sob stories as sales tactics. Of course this is easier said than done when someone is on the phone or right in front of you. No one wants to seem like the bad guy. Resist the temptation to help out then and there. Instead, tell them to send you further information or say you’ll do further research yourself before giving. Don’t ever let guilt be the reason you give to someone. There are very few cases where an honest charity will contact you first and that’s usually because they don’t have to. Moreover, they should never ask you for personal information like your bank account number or social security number. A good rule of thumb is to be extra cautious if a cause or charity contacts you and to avoid them altogether if they ask for any protected info. If they do, it’s probably a charity scam. While you probably aren’t going to keep track of a few dollars here and there that you give to charity, you should keep track of larger amounts you donate. That said, try to pay by check or credit card to ensure you have a record of your donation. Moreover, if your donation exceeds a couple hundred dollars, make sure to ask for a letter of confirmation. By keeping a record, you’ll not only be able to deduct it for taxes, but will be able to monitor your accounts just in case. Many people chose to donate to larger organizations like Make a Wish Foundation or the American Cancer Society. Although those are both wonderful and reputable charities, you likely won’t see exactly what your money goes to. Again, while this isn’t a big deal to everyone, it can be rewarding and reassuring to see how your money affects an organization in real-time. In order to understand and see what your donation gets used for and to possibly have the chance to get face-to-face time with the organization, giving to your local community can be a wonderful option. This is especially true, in that smaller charities usually don’t receive near the funding larger ones do, so your $500 or $1000 donation could mean big change for your local charity. Giving locally is my favorite way to avoid charity scams and see my dollars at work. 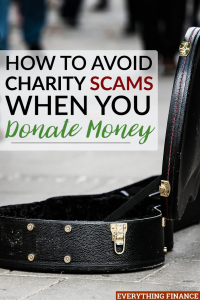 If you are especially worried about possible charity scams, one way to ensure no harm comes to your finances is by donating something that isn’t monetary. Consider giving material items instead. Organizations like Habitat for Humanity often have requests for things like nails, wood, or doors that you can donate instead. Another great option is animal shelters that need pet food or old towels and blankets, or soup kitchens that need groceries. Whatever you chose, you’ll know exactly how you’re benefiting a charity. Giving to charity is a wonderful, kind and compassionate way to use your money. It can be a truly rewarding process to know your funds are going to someone that truly needs it. Nevertheless, anytime you give away a significant sum, it’s important to ensure that it’s going to the right place and to those really trying to do some good. What are some ways you ensure that the charity you’re giving to is legitimate? Have you ever been caught up in any charity scams?